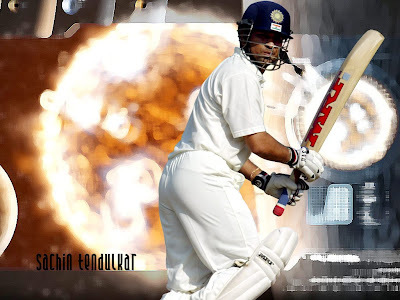 Living Legend Sachin Tendulkar - A site from a die hard Sachin Tendulkar Fan: Tendulkar a GLADIATOR. Tendulkar a Gladiator - not his records,money or popularity - it’s the hopes that he carries - the hopes of 20% of the world’s population.I wonder how this man can stand straight with so much on his shoulders. I wonder how he can afford to whack a 150 kmph Bret lee or Shoaib akthar ball in the air, well knowing that if he got out, he’ll break more hearts than Aishwarya Rai did when she married Abhishek. Probably that makes him a Gladiator - faith in his powers. Sachin is a more than a hero who can even bend the rules of cricket and take India to victory at any given stage.Every time he goes on to bat, the whole of India, if not the whole world that watches cricket, cheers, as if a gladiator has walked into an arena full of hungry tigers.The whole world watches every ball he faces from behind a pillow bunker as if their eyes shot rays of misfortune that’ll go through the TV screen and bowl Sachin out. No matter what the opposition does, as long as Sachin is out there, there’s hope India can still win, even if it is mathematically impossible. It is easy to criticize Sachin Tendulkar by citing his less than heroic 4th innings average, or his dismal average against big oppositions when chasing big scores - often the best indicators of a player’s dependability. It is also easy to quote the performance of Lara ,Ponting or Hussey, show how they are better. But it simply does not matter. This is not about proving that he is the best. He may not have rescued India as often as a player of his talent should have, but people BELIEVE that he is the savior, the GLADIATOR. It’s a question of perception. Sachin Tendulkar is a figure above logic.